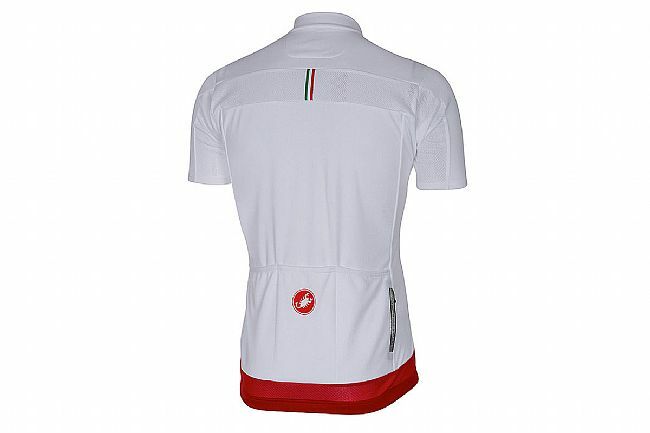 Castelli’s fifth generation of the Prologo Jersey marks a huge step forward in its goal of being your favorite jersey. Choosing to keep the relaxed Prologo fit and the moisture managing Stratus+ two-layer fabric, they’ve also added in a few updates making this jersey more comfortable than ever. Starting at the redesigned collar, a slightly asymmetric design protects your neck from the full-length YKK® zipper. Mesh side and shoulder panels improve the ventilation while simultaneously add a slightly elastic nature to the jersey, improving fit. On the back of the jersey is the usual 3 elastic pockets, plus a zippered pocket with reflective accents perfect for house or car keys.